The prettiest pink peppermint stick ice cream. Heat cream and sugar in a large saucepan, over medium heat, stirring often, until hot-but not boiling. Whisk the yolks together, in a large bowl, until combined. Gradually whisk half of the hot cream into yolks, until combined. Add the yolks into the saucepan containing the rest of the cream, whisking constantly. Continue to cook the mixture, stirring constantly, until custard reaches 170-175 degrees F.
Strain custard into a large bowl. Place the bowl in an ice bath for 15 minutes. Pour custard into ice cream maker and process according to manufacturer's direction. in the last 5 minutes of processing, add the peppermint candy, and allow to finish churning. Pour the ice cream into a freezer-proof container, and freeze for 2 hours, or until ready to serve. 16 comments on "Need Some Pep In Your Step?" I feel for you. I hate icy conditions and don't like driving in the snow either. I guess I should be used to it living in New England, but I still get nervous every time I hear freezing rain and snow in the forecast. The ice cream really looks devine. I can almost taste it! Hope your weather isn't too bad, but I've been watching that ice band across the mid-section. Thank goodness you had a fireplace to get you through the storms last year! 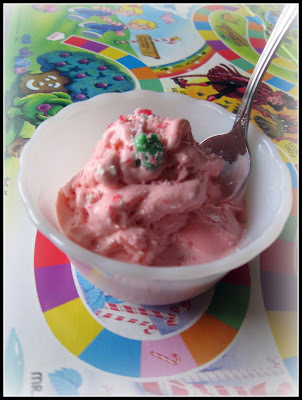 Peppermint Stick Ice Cream, a perfect addition to the holiday meal! My husband LOVES peppermint ice cream. He's been asking me to make him some homemade, so I'll give this a try. TWO WEEKS!!!!!!! That's insane. You should have driven to Las Vegas and camped out until the worst was over. I'll keep my fingers croseed that the weather folks are wrong. That ice cream, except for the peppermint part, looks great. Couldn't you have made Jamocha Almond Fudge (a flavor from my childhood)or even vanilla with a caramel swirl? Your Royal Food Joust badge looks great by the way. Congrats again! Nice touch with the Candyland board underneath the bowl. I didn't even notice the first time. Oh, how I love AZ right now, this is when we all realize why we actually live here! I would go nuts in the snow. However, all I can say is Yummmm about your ice cream. My family loves peppermint flavor ice cream. Looks great! Emiline--Good luck with the storms! I can relate, as we were without power for a week and a half after hurricane Wilma here in Florida. Thanks for stopping by my blog, by the way! Edwards is losing his voice too. So he made us watch this video on the elephant man. I just sat there drawing the whole time. I don't know if he cares that I wasn't paying attention or not. I guess I'll find out the next time I come to class. About 10 minutes and I can go home. Yum! You know right before we moved to Florida from VT we had the same exact experience! The week we were moving we had no pwer - so we were packing boxes with our winter parkas and gloves on. No electricity means no water, which means of course no toilet. We packed our cooler with our freezer stuff an buried it in the snow. We cooked everything and stayed warm with our wood stove in the basement. Luckily after a few days, they cleared the roads of all the downed trees and we were able to get to a friend's house in MA to sleep. it was a time I will always remember! Florida was so welcoming after that experience! You brought me right back!!! Annie- Thanks! I should shut up, since you live in New England. Janet- Thanks for your concerns, Janet. Columbia Foodie- Yes, I think so. Dhanggit- Swollen fingers sounds like a bad deal. Anna- I didn't even base this off of another recipe. I wonder how many are out there? Sue- Yes, 2 weeks was 2 much. I almost hopped on my private jet and flew to Vegas. You're a mint hater, are you? Lots of people are. Jamocha Almond Fudge sounds good, too. Jenny- Thanks! Arizona sounds pretty good to me, right now. Julie- That must have been scary. Jenn- That sounds like quite an adventure. So you can definitely relate how frustrating it was. Anon- You keep harassing me! Did I spook you? You should have seen your face. Wow - I can't imagine going 2 weeks without power. We get lots of snow, but luckily, we don't get ice storms. My mom makes something similar. SO good.